So many times when I buy a bunch of cilantro, I only need a few tablespoons. Then I have this huge bunch leftover, which doesn’t sit well with this mama. I hate to waste food, so whenever I buy cilantro I find myself scrambling to find ways to use it up. That’s how this recipe was born. I had a big bunch of cilantro that I’d only used a small snippet of and was on the brink of going bad. I poked around and realized I also had some leftover plain pasta and knew pesto was the answer to what I was going to do with my cilantro. I had everything I needed on hand. With leftover pasta in the fridge that just needed to be warmed up, this made a super quick lunch. A quick whiz of the food processor and it was ready. Cilantro is a natural cleansing agent and removes heavy metal and toxins from the body. Its oils aid and stimulate digestion. 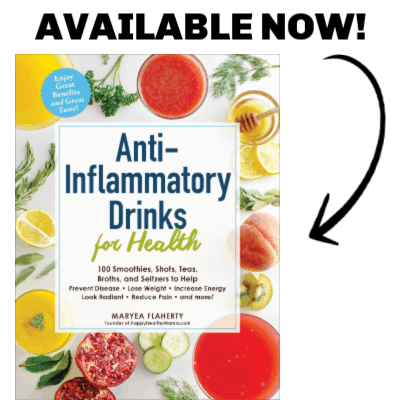 It has anti-inflammatory properties that are shown to help relieve arthritis symptoms. Cilantro can help relieve stomach gas (good for those of us who consume a lot of vegetables!). It can help ward off urinary tract infections. Quite an impressive list, no? You’ll never let that bunch of cilantro go bad in your fridge again! In a food processor or blender, process the cilantro, pistachios, oil, and garlic until smooth. Transfer to a bowl and stir in the cheese. 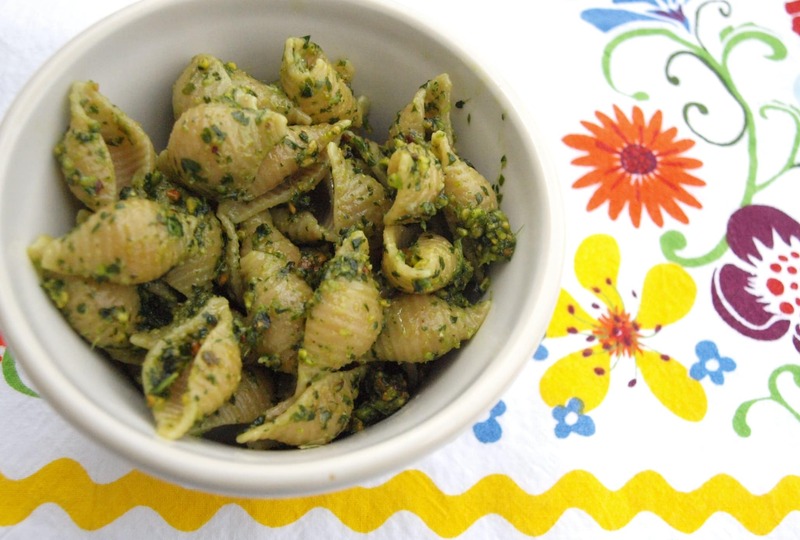 We mixed this pesto with pasta for a quick, healthy lunch. I had no idea if Meghan would go for it or not, as she is hit or miss when it comes to pasta, and she seems to be going through yet another picky stage. I tried to have her help me prepare it, but she was too busy playing and just not interested. I knew presentation would be key. Familiarity is so important to toddlers, especially when it comes to their food, so I decided to try to make this seem like something she knew. Because she now loves her green grilled cheese sandwich and is usually a fan of macaroni and cheese, I decided to tell her she was eating “green macaroni and cheese”. Giving it that name definitely helped. If I would have said, “Here’s your pasta with cilantro pesto” she probably wouldn’t have even tried it. She did try it and ate some of it. She didn’t finish her entire bowl, but for a first attempt at a food, I was happy. There are plenty of different ways you can use this pesto. Pesto naturally goes well with pasta. It would also be delicious as a sandwich spread, on top of vegetables, or spread on fish before cooking. Enjoy! How funny, I literally just made cilantro pesto a few nights ago! It’s so yummy! 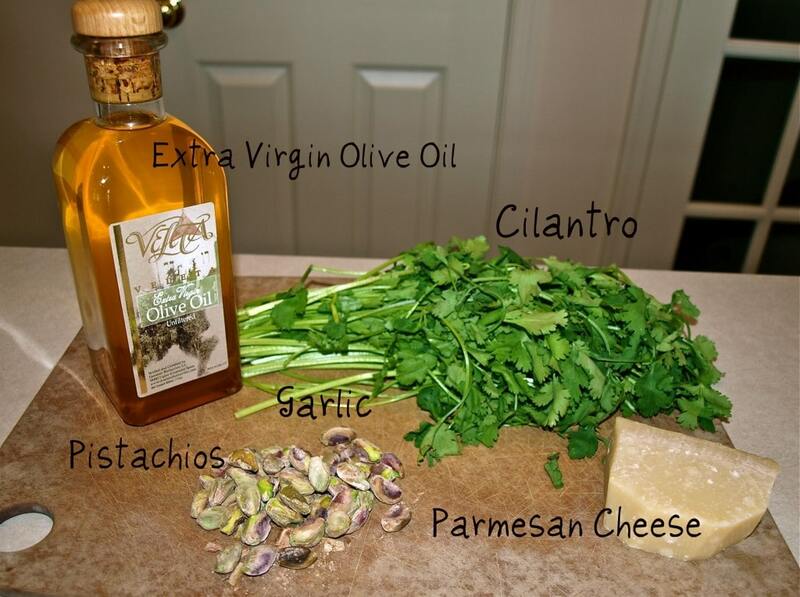 Cilantro is one of my favorite herbs! Being an Italian girl of course the other is basil 🙂 I used almonds though in my pesto, but I’m gonna use the rest of my cilantro now to make more this week, but this time I’ll try using pistachios instead! Thanks for the idea Maryea! P.S. I LOVE the nutritional stats on cilantro, thank you! I’m a new reader who recently started up my own healthy lifestyle blog! I LOVE your posts and think your recipes look delicious, healthy, and easy to make! Great info! Can’t wait to keep checking back…. Welcome to the wonderful world of blogging! 🙂 Thanks for stopping by and I will definitely be checking out your blog, too. I have the same problem every time I buy cilantro! I love this idea! I bet the pistachio+cilantro combo is AMAZING….too bad I just used up the last of my pistachios making pistachio butter! I have a friend who makes huge batches of cilantro pesto and gives me some, so that makes me happy. My hub hates cilantro. I was reading about it on Harold McGee’s blog and apparently to some people it actually does taste like soap. Weird, right? I also got a link to kind of some bad stuff about cilantro, though, on his site. I can’t remember what it was now. I just remember reading it to my husband and him saying, “I guess you can’t eat it anymore!” I guess I just ignored that news because I like it too much. I was curious so I looked up the article. Very interesting. It said that some study indicated it could damage your DNA, but the results were preliminary. I guess I’m going to take my chances until they come out with something more solid than that. 🙂 My hubs likes it, luckily. I spent the first 26ish years of my life not eating cilantro. I am making up for it now. I actually buy it weekly – I love it over salads and in wraps. Mmm…. 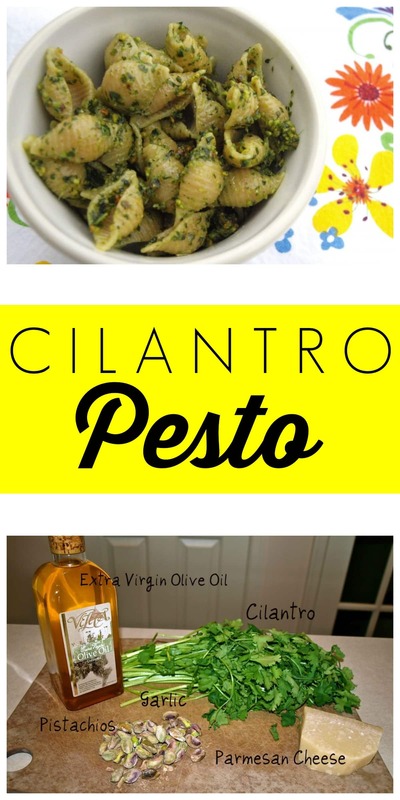 now I’m craving cilantro…..
I’m not a huge fan of basil pesto, but I love cilantro, so I think I will try this! Can you think of a vegan option for the parmesan, or do you think I could just leave it out? Candy- I know of lots of vegans that replace parmesan cheese with nutritional yeast instead. It’s nutritious and has a nutty, cheesy taste! I would try Nooch. Let me know how it turns out! I heart cilantro! I bookmarked this for my cilantro recipe tab in my binder i’m making. if I can find enough delish uses for cilantro i’m going to invest in a bush of it to grow! problem is I need a large pot and it will cost me about 11 bucks right now to start my cilantro plant. maybe more including soil costs. (im moving. no in-ground veggies allowed!) but I think for pico de gallo, dips, and this recipe… its totally worth the cost!!!! =) thx! I’m going to have to make this! Ryan will love it!! Cilantro is a huge hit in our house! I am so happy I found this blog – it’s right up my alley! Nice – never would have thought to try making it with cilantro before – must give this a try. Since you seem to be like me in hating to waste things, did you ever try “carrot top pesto”? Take the leaves from the tops of fresh carrots and fry them lightly for a bit to “wilt them down”, add some parmesan and walnuts and olive oil and blend up – it’s surprisingly good! What an interesting idea! I will definitely have to try that one–thank you. I tried this recipe tonight (but subbed pinenuts and added a little extra spinach) and my 3 kiddos (ages 1, 3, &5) loved it as did the hubs and I! What a great recipe, thanks. I am really enjoying your blog and love trying new things out on my kiddos. They were also big fans of the green grilled cheese… I appreciate someone doing some of the groundwork for me to get more fruits and veggies into my little charges! This recipe looks delicious! I made a variation of a cilantro pesto last night – I added the juice and the zest of one whole lime. YUMMY it tasted so refreshing !